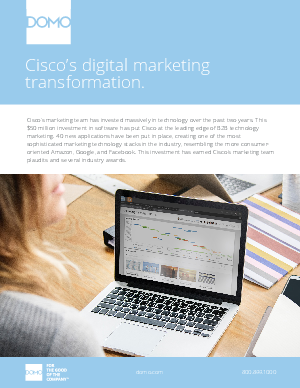 > Domo APAC > Cisco's Digital Marketing Transformation. Cisco’s marketing team has invested massively in technology over the past two years. This $50 million investment in software has put Cisco at the leading edge of B2B technology marketing. 40 new applications have been put in place, creating one of the most sophisticated marketing technology stacks in the industry, resembling the more consumeroriented Amazon, Google, and Facebook. This investment has earned Cisco’s marketing team plaudits and several industry awards.